Welcome to our online betting guide which has all the information you need to understand how online sports betting works. We cover all areas, from basic betting types and how odds work to a guide on how to seek out the best odds. We explain the difference between decimal and fractional odds and show you how a bookmaker works. Sports betting is one of the most popular pastimes for players all over the world. Sports betting is the activity of predicting the result of a sports event and placing a wager on the outcome of said event. It is possible to place a sports bet on almost all sports betting events at all levels, both professional and amateur. The most popular sports to bet on are Football, American Football, Tennis, Basketball, Baseball, Darts, Horse Racing and Boxing. In some countries, sports betting is also allowed on non-athletic events such as E-sports, political elections, talent shows, the Brexit and even the names of Royal children that have yet to be born. In short, if there is a non-predetermined outcome, you can bet on it. A Bookmaker (Sportsbook, Bookie, Off Track Betting, Betting Office) is an independent organisation that takes bets on sporting and other events at agreed upon odds. A bookmaker determines the possible payout at a particular stake en gives the punter odds on the outcome. If the prediction of the bet is correct, the bookmaker will pay out accordingly. Bookmakers use fixed odds – the odds that you are given when making a bet must be honoured. Bookmakers operate both offline (in betting shops, at horse racing tracks and in casino sportsbooks) and online. Although Bettingmargins.com focuses mainly on online betting, the knowledge and information on this site can also be used to your advantage when placing an offline bet. How does a bookmaker make money? A bookmaker will make money by adjusting the odds in their favour. They will aim to guarantee a profit whatever the outcome of a sporting event by achieving a so-called ‘balanced book’. This is accomplished by getting an equal amount of bets on each outcome of the result to reflect te odds. By building in a betting margin in the odds, the bookmaker will always make a profit. If a significant amount of money is placed on one particular outcome, the bookmaker will change the odds to attract more bets on other results, thus “balancing the book”. A bookmaker may also lay off the risk by placing bets at other bookmakers. A bookmaker does not make its money from the bets themselves but rather act as market makers. Some bookmakers take higher betting margins than others, which can have an adverse impact on the payouts of winning bets of punters. The biggest bookmakers are huge billion-dollar companies with hundreds of thousands of customers. Most are listed companies. A punter (bettor, player, customer) is a person or syndicate of persons that place a bet with a bookmaker. In the United Kingdom, the term that is most used for persons placing a bet is “punter”. In the United States, they are called “bettors”. Odds are a reflection of the chance or probability of a particular outcome in an event. With every event, there is a certain chance of an outcome taking place. The odds are simply an interpretation of the bookmaker of these chances. Odds are expressed either fractional or decimal. Fractional odds are most common in The United Kingdom, while in players in Europe, Australia, Canada and New Zealand prefer decimal odds. Most bookmakers allow you to choose how the odds are displayed. Payouts on fractional odds and decimal odds are the same. In decimal odds, the payout includes your original stake. Decimal odds reflect the chance of an event happing. To convert a chance into decimal odds, you need to take the chance as a % and divide it into 100. So if you think something has a 25% chance of winning then the decimal odds will be 100/25 = 4. Should the punter put a £100 bet on Barcelona to win, he will be paid out £108. If the result is a draw, the punter will get £950 on a £100 bet. Should Malaga win, the punter will receive £2,600 on a £100 bet. Whenever the outcome of an event is very likely (in this case, for Barcelona to win), the odds are close to 1. In this example, Barcelona is a clear favourite to win a home game against a much weaker opponent – leading to odds of “only” 1.08. The chances of Malaga to win this game are significantly lower – that is why the odds on this bet are a massive 26.0. Fractional odds are also known as British odds, UK odds or traditional odds. Fractional odds will reflect the profit a punter makes on a winning bet. The initial stake is not included in the odds, where it is included in decimal odds. Fractional odds are displayed in the form of a fraction, making it harder to calculate your winnings. When the fractional odds are 1/4, a stake of £100 will pay out £125. The profit on the bet is £25. With fractional odds of 8/5, a stake of £100 will result in a total payout of £260, a profit of £160. 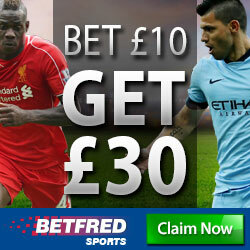 With fractional odds of 3/1, a stake of £100 will pay out £400. The profit will be £300. Payout ratios – what percentage is paid out? Bookmakers have operational costs when offering bets: overhead, odds-setting-systems, personnel and marketing costs. To compensate these costs and to also make a profit, less is paid out in winning bets than the total amount that is staked. De total payout of all winning bets divided by the total stakes is called the average payout. A payout percentage of 95% means that the punter will, on average, be paid out £95 out of every £100 that is staked. Calculating the payout ratio of every single bet is possible. In our second example, we will look at an event with 3 possible outcomes -a Football match. The possible outcomes are: a home win, a draw and an away win. Of course, it is possible to calculate the payout ratio for fractional odds in the same way. The betting margin is the profit margin for the bookmaker, calculated over the odds. In a perfect book, this percentage will also be the profit margin for the bookmaker. In practice, it will differ, as it is rare for the bookmaker to set a perfect book. The amount of money staked will nearly always (slightly) favour one result over the other. The betting margin equals 100% -/- the payout ratio%. The betting margin is: 100% – 92,3% = 7.7%. With a perfect book, this bookmaker would make a profit of 7.7% on the total of all bets placed. The lower the betting margin, the more a player can win with the bet. The total sum of money that is placed on a particular outcome is called the stake. Bookmakers often give out welcome bonuses to new players. 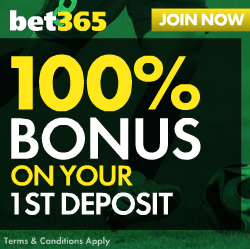 Some welcome bonus come in the shape of a deposit bonus (deposit £20 and get £50 to play with), a no deposit bonus (free £10 bet) or a combination (get 100% bonus plus a £5 free bet). To be able to turn the welcome bonus into real money which can be paid out, the player must meet bonus terms and conditions. Often, the bonus money has to be staked a certain number of times at minimum odds for it to turned into real cash. Welcome bonuses are a great and relatively cheap way to get acquainted with a bookmaker and to get a good feel for how the bookie works, how good the odds are how it treats its players. A two-goal lead, a red card for the goalkeeper, a striker that shows great form or even changing weather conditions can impact the odds within live betting on a game. Most major bookmakers offer live betting on the biggest sports. Due to the higher risks that come with live betting, the odds are considerably lower on live betting than on regular bets made before the start of an event. Some bookies offer the cash-out option in combination with live betting. It gives you the option to cash out an open bet before the game has ended at lower odds. This option can be very useful for players that have a “winning” bet and want to protect the result, even if it means taking a smaller profit. This option is even available on “losing” bets, giving the player the chance to take their losses and recuperate a small portion of his original stake. Bookmakers, like most companies, seek to make maximum profits and minimal losses. Of course, they want to take as many bets as possible, but at the same time, they want to minimise their risks. A huge payout on one single, once-in-a-lifetime, bet or a high roller player betting hundreds of thousands, can break their monthly or even yearly financial results. To minimise their risk, most bookies implement maximum payouts on bets, especially on multiple bets (called Parlays or accumulators). Furthermore, they might impose restrictions on some heavy bettors, giving them less freedom to place bets that might hurt the business. As a rule of thumb, the bigger bookies offer higher maximum payouts, while smaller bookies will impose lower maximum payouts. Hedging a bet involves placing bets on a different outcome, or outcomes, after placing an original bet. The effect is that a situation is created where there is a guaranteed profit, whether the original bet wins or loses. Hedging a bet on the winner of a tennis or golf tournament is one of the most common uses of the hedge betting strategy. The best way to explain how hedge betting works is an example. For example, you have picked player X to win a Tennis tournament and have staked £100 at decimal odds of 51. The player manages to make the final game of the tournament. If player X wins, you will be paid out £5,100 – a nice profit of £5,000. If Player X loses, you get nothing. You can take the decision to hedge the bet by betting money on the other player. That way, you are guaranteed a profit, whatever the outcome of the match. Example 2: you have placed an accumulator bet on 10 matches. The first 9 matches were predicted correctly. The final game is about to start and team A needs to win for the accumulator to pay out. If team A wins the game, you win £50,000. You can now decide to hedge the bet by betting on a draw and team A to lose. Arbitrage betting in sports betting will guarantee a profit whatever the result of the event will be. Bookmakers will always offer different odds on the same outcome of an event. Arbitrage betting (also known as sure bets) is achieved by simultaneously placing bets on all possible outcomes of an event at different bookmakers, profiting from the difference in odds. In practice, you need to find the best available odds on the market and calculate how your total stake must be split between these odds. The bets are placed at the different bookies, and the profits are collected when the result is final. To be successful at arbitrage betting, you need multiple bookmaker accounts and great speed and efficiency. Odds can change within a few minutes (even seconds), leading to different calculations and new scenarios. Therefore, arbitrage betting should only be done by experienced punters and with great caution – profit percentages are small, and there is always the risk of a bookmaker restricting your bet. There are tens of different betting types. Different bet types will come with different risks and, as a result, different odds. For instance, an outright bet on West Ham United to win the Premier League (low probability) will pay out between 1,000-1 and 5,000-1, depending on the bookie. A bet on Chelsea to win their home game against Swansea (a very high probability) will result in 1-4 odds (1,25 in decimal odds). Here is a rundown of the most important bet types. A single bet is a bet on 1 selection in one event. Your selection must be successful to get a return. In some events, such as Basketball, Darts or Tennis, only two outcomes are possible. In Football, there are 3 possible outcomes (win, draw, loss). An outright bet is placed on the outcome of an entire competition, tournament or political event. Outright bets can be placed before the event and sometimes during the event. Outright bets can be placed weeks or even months before the event starts, giving punters the opportunity to seek the best odds far in advance. An accumulator bet is one bet on any number of selections, but all the selections must win to have a payout. Winnings of accumulator bets are calculated by placing all the money on the first selection, and the winnings from that bet are placed on the next bet and so on. In the USA accumulator bets are referred to as Parlays. Accumulator bets, or “Acca bets” are very popular due to their high potential. As each winning is placed on the next bet, accumulator bets can pay out huge amounts of money with small stakes. In head to head betting, you essentially bet on the outcome of a match between two competitors. It is a simple bet type which explains its enormous popularity. A bet with two possible outcomes ( i.e. a Tennis or Darts match) is called a 2-way bet. A bet with 3 possible outcomes (Football or Hockey) is known as a 3-way bet. Verstappen against Ricciardo in a Formula 1 Grand Prix match. Head-to-head bets are often also offered in sports with big fields and where outright bets are also available. The advantage of Head-to-head bets is that the payout ratios are often higher than on outright bets. In other words, a bigger portion of the money that is put in is paid out to the punter. 1×2 bets are placed on games where a draw is a possible outcome -Football, Hockey). Most sports events only have a (Home or Away) winner as the possible outcome (Tennis, Darts, Snooker). In the event of Spain winning the match, the punter will win £104 on a £100 stake (a profit of £4). In the event of a draw, the punter receives £2,300 on a £100 stake (a profit of £2,200). In the (unlikely) event that Macedonia wins, the punter gets £5,100 (a profit of £5,000). Spain is the big favourite in this match. The likelihood of a draw or an away win is very small. The odds reflect this. A 1×2 handicap bet is essentially the same as a 1×2 bet with one difference: one team will get a handicap of 1 or more goals. Handicap betting is often used when one of the teams is considered to be much stronger than the opposing team. The stronger team will get a handicap of 1 or more goals to “even the odds” a bit. This will lead to higher odds of the handicapped team. In the game Spanje versus Macedonia, Spain gets a 3 goal handicap. To get a result on a home win, Spain will need to win by 4 or more goals difference. If Spain wins by 3 goals difference, the result of this game is a draw. All other results lead to a “2”. Of course, the chance of Spain winning with a 4 goal or more goal difference is much lower than the chance of Spain winning without a handicap. As a result, the odds on Spain to win with a handicap went from 1.04 (no handicap) to 1.95 (with handicap). In other words: the bookmaker finds it likely that Spain will not win by 6 goals or more. An Asian handicap bet is often used for Football bets. One team will get a handicap of 0.5, 1.5, 2.5 or 3,5 goals, etc. Asian Handicap events can only have two outcomes: a home win or an away win. Again, we will take the Spain versus Macedonia as an example. Spain gets a 3.5 goal handicap. Should Spain win by 4 or more goals, the result is a “1”. In all other cases, the result is a “2”. A very attractive bet where punters need to predict the (exact) correct score of the event. The bet type will offer higher odds than most other bet types due to the complexity of predicting the correct score. Odds on unusual scores (6-4) will be significantly greater than odds on more common scores, such as 1-0 or 2-0. To make betting on sports have an even broader appeal, most bookmakers will offer bets on special markets. Most bookmakers will offer between 20 and 50 special bets on most games. Special bets give the player more variety and extra options. Punters should be advised that the payout ratios on special bets are usually lower than on regular bets such as 1×2 bets, Asian Handicap bets or Win/Lose bets. The Double Chance bet is a very popular bet on Football as there are 3 possible results for this type of game. A double chance bet combines two outcomes. For example, a 1X bet will pay out when the result of the game is either a home win or a draw. The bet will not pay out if the away team wins. The odds on Double Chance bets are considerably lower than odds on single bets as player essentially get two bets combined into one bet. A Draw No Bet is a bet type with only 2 possible outcomes (home team wins, or away team wins). In the case of a draw, the bet is declared a “no bet”, and all stakes on the bet are returned to the player. The same bookmaker offers the following odds on the Draw No Bet bet type. A bet is placed on the result of the first half of the game only. This can be any type of bet such as a 1×2 bet, Asian Handicap or a special bet. A bet is placed on the result of the second half of the game only. With an Even/Uneven bet, the punter bets if the outcome of certain events (the number of goals, the number of corners, the number of yellow cards, etc.) will be even or uneven. Uneven is 1, 3, 5 etc. Uneven is 0, 2, 4 etc. Here, the punter has to predict whether the total number of events (goals, corners, rebounds, throw-ins, etc.normal) is over or under the line (the total number) that has been set by the bookmaker. There is no draw (push) possibility for this bet. It means you will win or lose your stake at the end oregularplaying time (overtime and penalty shootouts do not count).